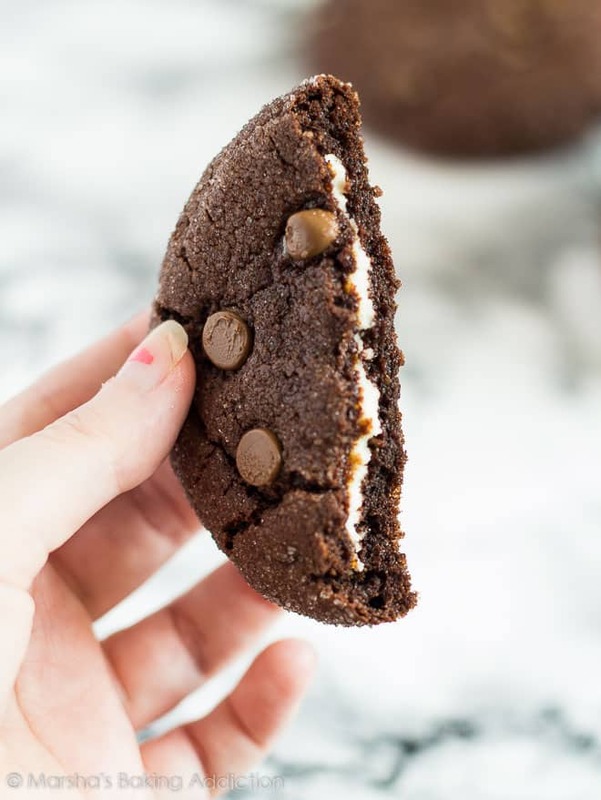 Cheesecake Stuffed Double Chocolate Cookies – These deliciously thick and chewy chocolate cookies are stuffed with creamy cheesecake, and studded with chocolate chips! Guys, I made my Favourite Chocolate Chip Cookies chocolate flavour, and stuffed them with cheesecake. 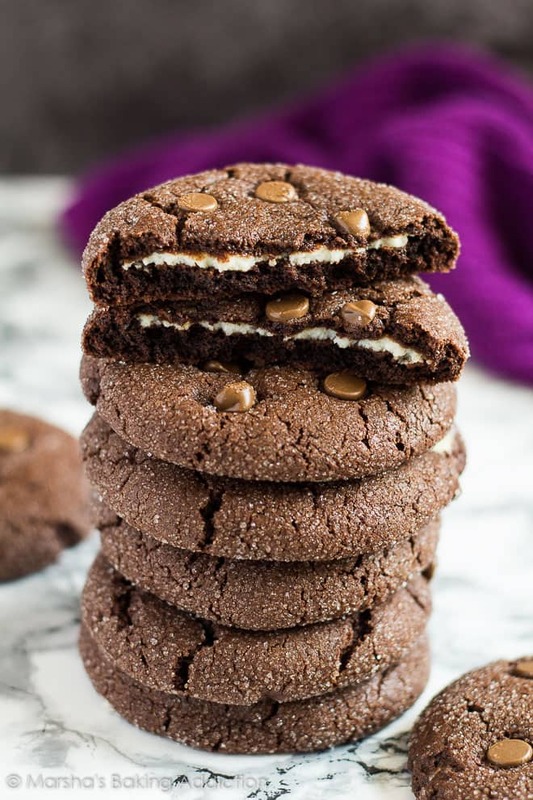 Cheesecake Stuffed Double Chocolate Cookies! Best decision ever. I absolutely love this cookie recipe. That’s why I call it my favourite. Today, I’ve made them even better, and now I can’t decide how I like them! To make these cookies, let’s start with the cheesecake centres. Beat together the cream cheese, sugar and vanilla extract until smooth and combined. Place 9 – 12 teaspoons of the mixture on a baking tray lined with parchment paper, then freeze until solid – about 1 – 2 hours. 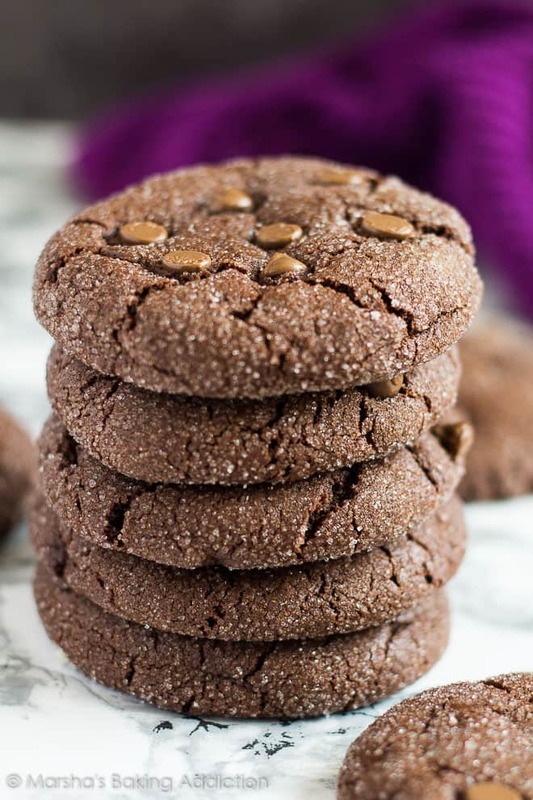 For the cookies, whisk together the flour, cornflour, baking soda, salt, and cocoa powder. Set aside. Whisk together the butter and sugars until combined. Add the egg, and vanilla, and mix until combined. Add the dry ingredients, and mix until just combined. Roll the dough into 2oz balls – about 9 big balls. Or you can make about 12 smaller balls. Form the balls into flat, round circles, and place 1 teaspoon of the cheesecake mixture into the centres. Form the dough back into balls, sealing the cheesecake centre. Roll each ball in granulated sugar, and press the chocolate chips on top. Place the dough balls onto a baking tray lined with parchment paper or a silicone mat, flatten them slightly (them won’t spread much in the oven) and bake for 10 – 12 minutes. Allow to cool on the baking tray for 5 minutes before transferring to a wire rack to cool completely. 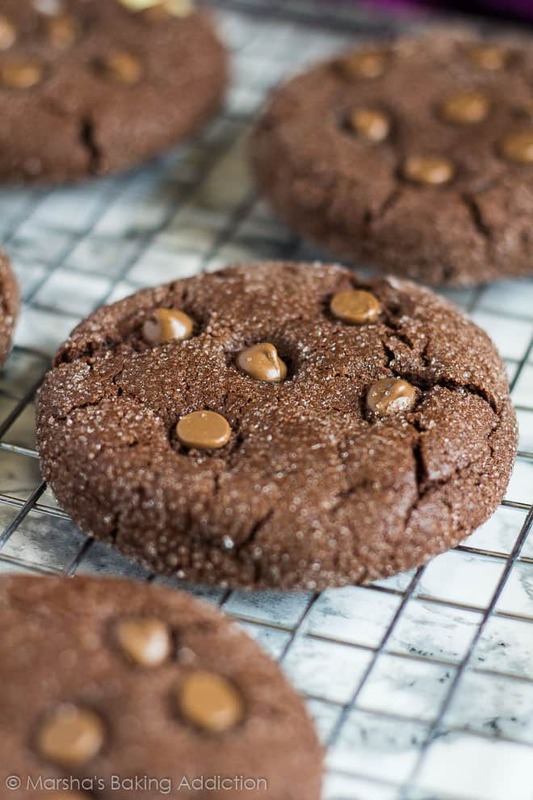 This recipe makes 9 big cookies, or 12 normal-sized cookies. Decide how many you want to make, and that’s how many teaspoons of the cream cheese mixture you want to freeze. 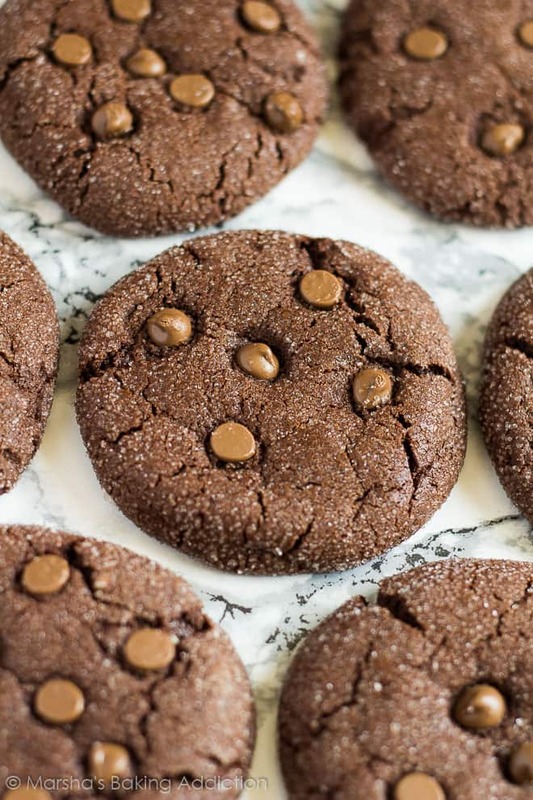 How long will these chocolate cookies last? These cookies will stay fresh, kept in an airtight container, at room temperature for up to 1 week. Can I freeze these cookies? Yes! These cookies freeze well for up to 3 months. Thaw overnight in the fridge. Prefer freshly baked cookies? Cookie dough balls can be kept in the fridge for up to 5 days, or frozen for up to 3 months. Bake from frozen. More delicious cookies to try! 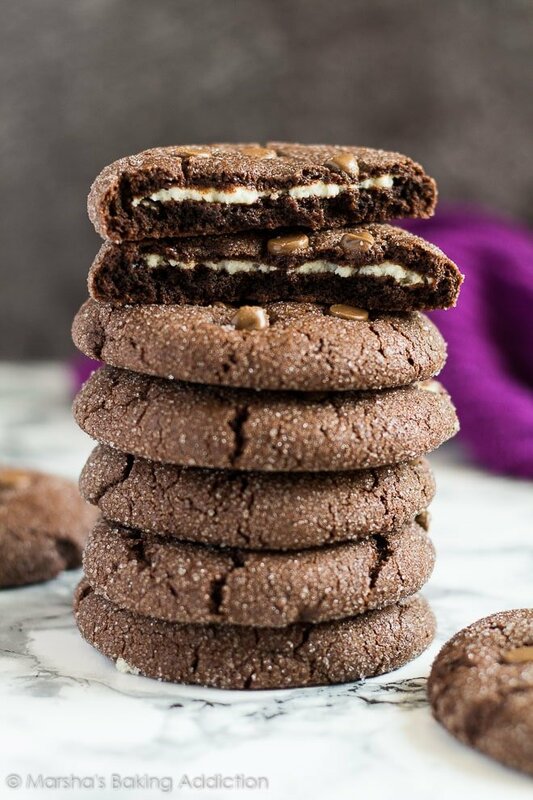 These deliciously thick and chewy chocolate cookies are stuffed with creamy cheesecake, and studded with chocolate chips! Beat together the cream cheese, sugar and vanilla extract until smooth and combined. Place 9 - 12 teaspoons of the mixture on a baking tray lined with parchment paper. Freeze until solid - about 1 - 2 hours. Whisk together the flour, cornflour, baking soda, salt, and cocoa powder. Set aside. Roll the dough into 2oz balls - about 9 big balls. You could also make about 12 smaller balls. Form the balls into flat, round circles, and place 1 teaspoon of the cheesecake mixture into the centres. Form the dough back into balls, sealing the cheesecake centre. Roll each ball in granulated sugar, and press some chocolate chips on top. Place the dough balls on the prepared baking tray, flatten them slightly (them won't spread much in the oven) and bake for 10 - 12 minutes. Allow to cool on the baking tray for 5 minutes before transferring to a wire rack to cool completely. OMG, these are some crazy decadent and delicious cookies, Marsha!! LOVE the cheesecake stuffing!! Cheers, girlfriend! What an amazing invention! I’m a chocolate fanatic, so right away these sound good. But stuffing a cookie with cheesecake is a heavenly idea! i haven’t had a chocolate cookie in the longest time, and certainly not one stuffed with cheesecake! what a great idea and your execution is perfect–bravo! 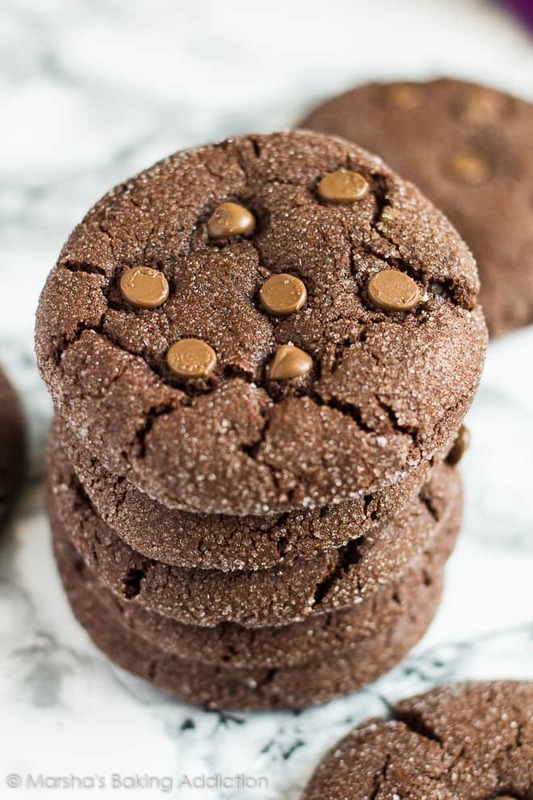 These chocolate cookies are SO beautiful, and they look incredibly delicious. LOVE that delish cheesecake filling! Does it get any better?! These are seriously making my mouth water! Beautiful! What a fabulous idea to stuff the inside of the cookie with some cheesecake goodness! This is some serious deliciousness here 🙂 Yummed and pinned! Seriously best decision ever! These look out of the world. Pretty sure I would eat the entire batch in one sitting, and not regret a thing! 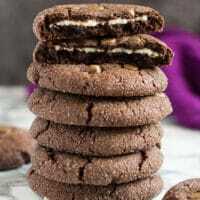 What can be better than cheesecake double chocolate cookies! I want to try this!! Wow! These cookies are really something I would like to much on all day long. So so good. 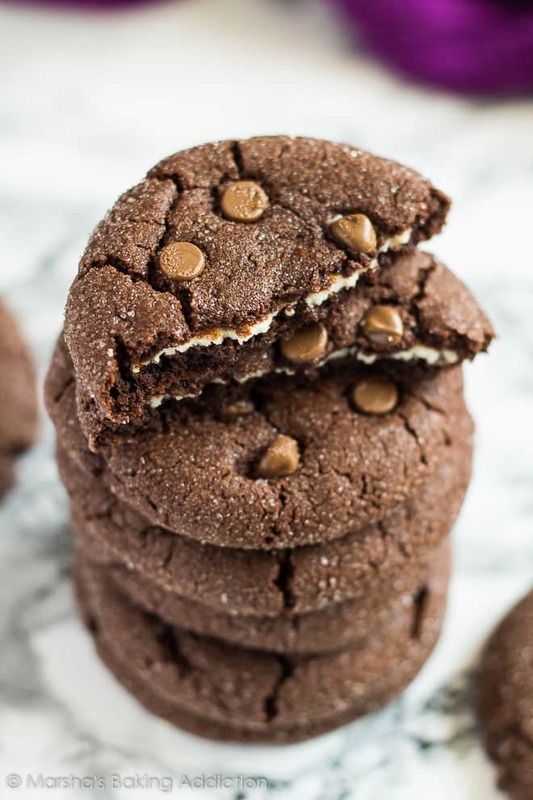 These cookies are so decadent! I love that layer of cheesecake in the middle it really takes it over the top!